LAWRENCE, MA--(Marketwire - August 8, 2008) - The National Aquatics Center or "Water Cube," a landmark of the Beijing 2008 Olympic Games, features floor coverings from nora systems, Inc. More than 107,000 square feet of noraplan® mega covers corridors and high traffic areas throughout the center, offering comfort underfoot as well as safety, maintenance and wear-resistant properties important to athletes and visitors to the site. Located inside the Beijing Olympic Green, the Water Cube is part of the National Stadium complex and serves as the venue for swimming, diving, synchronized swimming and water polo competition. The work of a consortium consisting of China State Construction Engineering Corporation, China State Construction International (Shenzhen) Design Co. Ltd., PTW Architects and Ove Arup, the building features a unique prototype cladding which allows high levels of natural daylight into the building to heat the interior as well as the pool water. The award-winning design is expected to reduce energy consumption by 30 percent as it meets requirements for sustainability and safety. The aesthetic and performance characteristics of noraplan mega make it the ideal choice for the aquatic venue. noraplan mega's soothing three-dimensional pattern enhances the interior design and offers excellent wear and slip resistance -- extremely important for a venue expecting 17,000+ visitors during the 2008 Olympic Games alone. Like all nora products, the floor covering's unique, dense, nonporous surface resists dirt and stains and never needs waxing or sealing. As a result, the floor covering ensures easy cleaning with low maintenance costs. nora products, including noraplan mega, also offer fire-resistant properties that are important to building owners. 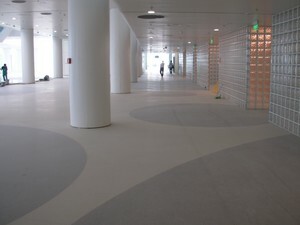 The flooring coverings do not contain any PVC or halogens. This means that in the event of fire, no hazardous hydrogen-chloride gases, toxic dioxins or furans are produced. The floor covering is also GREENGUARD Indoor Air Quality Certified®, GREENGUARD Indoor Air Quality Certified for Children and Schools™ and California 01350 compliant, contributing to healthier indoor air and supporting the aquatic center as a model of green design. In addition to important performance properties, noraplan mega delivers attractive design elements to the center. Flecks and clusters of color in the floor covering create a three dimensional pattern that is available in 20 colors. The floor's smooth nonglare surface delivers the same aesthetically soothing effect throughout the Water Cube that it brings to a variety of U.S. installations, including Gaston Memorial Hospital, Gastonia, N.C., Texas Heart Institute, Houston, Texas, and Monroe Carell Jr. Children's Hospital at Vanderbilt, Nashville, Tenn.
nora systems, Inc. has been located in the United States for more than 30 years. It is the U.S. headquarters of German-based nora systems GmbH, the world's largest manufacturer of commercial rubber floor covering systems. The company has been designing and manufacturing nora rubber flooring for more than 50 years, meeting a wide range of functional performance requirements while paying close attention to the aesthetic aspects of interior design. For additional information, contact nora systems, Inc. at 1-800-332-NORA or visit the company's web site at www.norarubber.com. About this company nora systems, Inc. The Water Cube is the venue for swimming, diving, synchronized swimming and water polo competition at the Beijing 2008 Olympic Games. 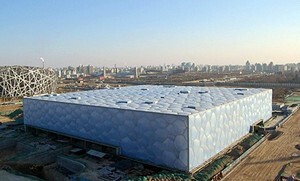 The National Aquatics Center or "Water Cube," a landmark of the Beijing 2008 Olympic Games, features floor coverings from nora systems.